I had an amazing time in Prague! Certainly I had embarked upon this trip of a lifetime with certain expectations or thoughts on how it was going to go. None of these were met, but blown out of the water! At first it was a major culture shock to be staying in a place still scarred by the Communist era, since the Velvet revolution happened in very recent history. There is no wifi as available in the States, water is not free at restaurants, and there is a vague stigma against westerners. Despite these differences in culture, it is the forgotten romance city, with beautiful architecture, rich history, and of course amazing food! Besides the city itself, the class I had taken there was very informative as well! We had lecturers who were the top in their respective fields and had also heard personal migration stories. I would highly recommend this study abroad experience for anyone looking to learn a lot and have a blast while doing it! 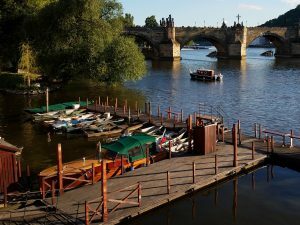 **View of the famous Charles Bridge from a walkway next to the river Vltavska. This entry was posted in Uncategorized by jared_mrvos@student.uml.edu. Bookmark the permalink.